Before I get to the good stuff…aka 5 odd/quirky yet lovable things about me haha I will share lunch and my workout plan for this evening!!! Ok, so after breakfast I had a handful of chocolate covered raisins- courtesy of my office kitchen and also a bag of Angie’s Classic Sweet & Salty Popcorn (tastes like kettle corn, but is made with all natural ingredients like popcorn/sunflower oil/ evaporated cane juice/& sea salt..yum!). 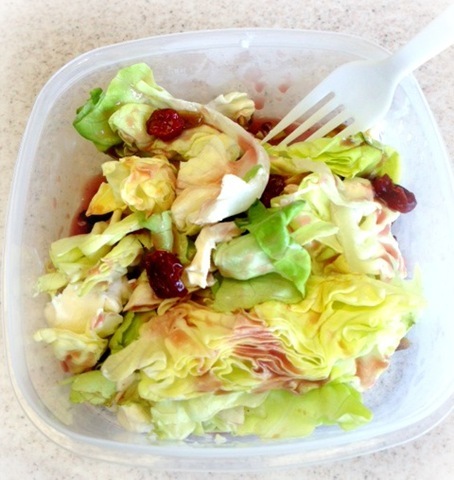 Then for lunch I had a salad with butter lettuce/dried cherries/brie cheese/pistachio meat (the inside sans shell)/& Annie’s Raspberry Vinaigrette dressing…. 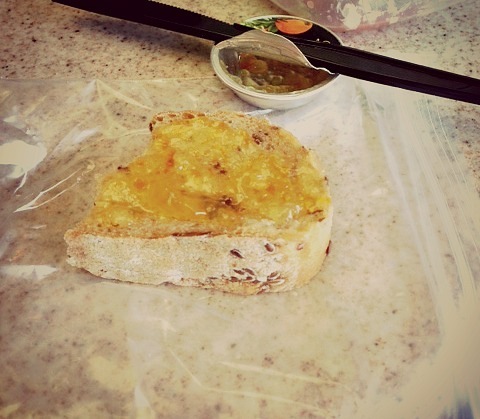 On the side I also had a piece of multigrain french bread with orange marmalade spread on top! Yum, nothing better than a piece of fresh bread!! And, orange marmalade is my ultimate favorite jam, so that was an added bonus! On to my workout plan that I made..I will be doing a run similar to last Monday, which was where I do a 4 min. incline walk, 4 min. jog/run, 2 min. hard incline walk, and then repeat this with added intensity! 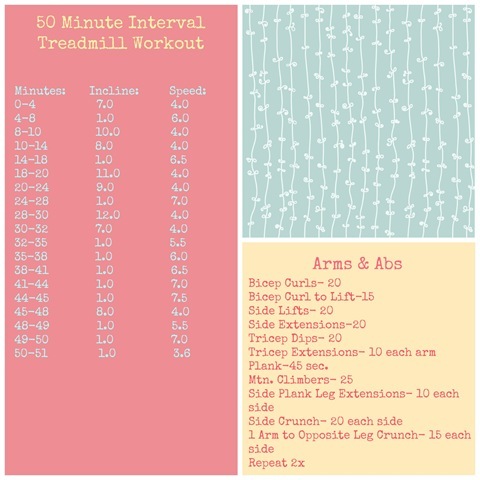 This treadmill workout is definitely one of my favorites, as it incorporates enough recovery time to be doable and also mixes things up so I never get bored while I do it! Then, I plan on doing some arms & abs to round out my workout, so we will see how this goes! Ok, now on to 5 things about me time! Woo! I have known that I wanted to be a lawyer since I was in 8th grade and have never changed my mind, despite people telling me how hard law school is/ how boring being a lawyer can be haha apparently i am just a boring nerd who is looking forward to law school..what can i do?! I am the oldest of 4 kids and have a bizarrely close knit family! Ask anyone who knows me and they will tell you how much we all support each other, make each other laugh, and are there for each other! We also are hugely sarcastic and so most of the time we are just making jokes that only we think are funny haha it’s weird, but whatever..i love my fam! I make BOMB cd’s/playlists! In high school I was always designated to make people cd’s like monthly and I loved it! Some of my friends even tell me that they still listen to mixes I made like over 4 years ago! haha I just have a gift of picking the right placement of songs, so that the playlist always seems to have variety and a nice flow from song to song…I seriously shoulda been a DJ! Screw law school, new life plan! haha just kidding, if only I could support myself on a DJ salary I’d probably be in! I can’t sleep in! It’s like I am kind of a grandma…I like to be in bed by 10 and I can wake up easily at the crack of dawn! Morning workouts are no prob for me because I honestly don’t mind getting up at 5 am! There is something about the calmness early in the morning that I just love and though sleeping in is nice on the weekends and every once of a while, I am definitely an early bird! Ok everyone! Hopefully you now know a little more about me! If you have any more questions or anything you want to know about me just leave a comment and I will answer your questions!